LitGraphic: The World of the Graphic Novel will examine the use of sequential art as a significant form of visual communication, and place specific emphasis on the art of the contemporary graphic novel. This special exhibition will feature over 200 original art works, including paintings, drawings, storyboards, studies, books, photographs, and a documentary film, offering insights into the lives of the artists and the nature of their work. I’ll be looking to head out there once the show opens. Sadly, my blog has been largely abandoned for some time. But I have now been roused from slumber by a group of friends intending to shame each other into returning to our musing avocations. The goal is to post a set number of times per week. And as I keep the blog stumbling along into its fourth year, I am reminded that actually doing things always has its slogging moments. The Rotation is a thematic challenge, started every week by a rotating member of the Blogenning. The first post of this week by the scheduled member becomes the challenge theme, and the same topic/category of post must be written by all members of the Blogenning that week. This means that if I write about rabid bunnies on my week as my first post, you all have to write about them at some point. Or if my first post of the week is a poem, you all have to post a poem by the end of the week. This post *does* count towards your weekly total, so it is not “extra.” The punishment for failing The Rotation is to produce an extra post the following week to make up for it. If I still fail to produce said post… the group shall think up an appropriate punishment. We’ll have to see how well I can find short stories about rabid bunnies or what have you. I recently finished Changeless, the second of Gail Carriger’s Alexia Tarabotti novels. I thoroughly enjoyed the book and would absolutely recommend it, but it ended on a painful note. I was left wandering Logan airport with a hole in my heart that rightly belonged to a fictional character. It’s that ‘Empire Strikes Back’ feeling–the deep slump that comes in the middle of things (though I should note that the Alexia Tarabotti novels are not a trilogy–there are at least five planned). It was refreshing to get that deep depression. I can’t think of the last time I read a second volume that so unabashedly ended with a serious downer. Are we generally spoiled by happy endings? When that pain is done right, it’s a special kind of rush. To this day, Empire Strikes Back is my favorite of the original three Star Wars movies. A couple years back, I posted about a really fun zombie story by Isabel Kunkle, who I’ve since had the pleasure of meeting. I’ve just discovered that Izzy’s new book, Hickey of the Beast, is being serialized by Candlemark and Gleam, an intriguing e-book publisher. Bad dreams? No big deal. After all, Connie Perez is starting her first year in the prep school her mom runs. Anyone would be a little stressed, right? When she starts dreaming about strange creatures and places that don’t make sense, she doesn’t think much about it: there’s other stuff on her mind. Then she starts noticing that the people she dreams about get sick right afterwards. There’s something bad on the campus of Springden Academy. Something that feeds on students and warps their minds. And, as Connie and her friends try to figure out what’s going on, it starts to look like she’s the only one who can stop it. Freshman year was hard enough without having to fight evil after class. You can sample the first chapter here. I enjoy Izzy’s writing, but I’m also interested in Candlemark and Gleam’s approach. They’re selling a basic subscription to the serial for $5, but then they offer a variety of bonus packages. Many of them include bonus stories, but the Plutonium package takes the cake: for $25, you get the subscription to the book, the bonus stories, an iron-on patch, and a custom one-shot tabletop RPG scenario written by Izzy. You can choose whatever RPG system you want. I bought the Plutonium package just to make Izzy work 😉 — but seriously, I am not sure how sustainable that is. I love the concept of subscriptions with bonus features. I think that’s very clever, and probably the way you have to do things these days. On the other hand, I hope the custom RPG has some sort of formula that makes it easy to put together. It seems underpriced to me. Authors already have to work very hard for very little money, unless they’re JK Rowling. I am a little worried about setting a precedent for that degree of personalized attention for the price of your average hardback. As far as logistics of distribution go, I found Candlemark’s system a little confusing. They’re linked to PayPal, which is good, but require you to make your own account for their site, which I don’t love doing. If I didn’t know Izzy, I might not have gone through with that. After I bought the book, I received a confirmation e-mail right away, but it actually took me a while to figure out where to read chapter one, and I’m not sure how or when I’ll get the rest of my stuff. My verdict on Candlemark’s approach is that I’m totally intrigued, but I think it needs more polish. I love the idea of bonus material, but I worry about placing too much burden on the author. But enough geeking about e-book distribution! Go read the first chapter! Clarkesworld is experimenting with the pricing of their ebook edition, dropping it from $2.99 to $0.99 for the March issue, #54. The elevator in my office building has a screen in it that shows headlines, stock quotes, polls, and vocabulary words. Over time, staring at its vocabulary words has made me realize a real failing in how the idea of a richer vocabulary is generally presented. Example: Laura was thrilled by the pulchritude of her new four-inch heels from Bebe. This use of the word irritates me because there’s no reason not to just say “beauty.” There’s no sense of what might make pulchritude a better word to choose. There’s no sense of how it differs, or how it shades meaning. It must be different, because it rings so strangely in that sentence and that context, but I’m not given any understanding of how. I think vocabulary lessons like this, which are similar to how I learned vocabulary in school or how it shows up on standardized tests, give the impression that you use these “50-cent” words to show off and exclude stupid people, not because they are really better words to choose. As a journalist, I’m trained to write simply, so I have been doubly biased against these words. What’s recently cured me of this impression is the prose of China Mieville, Joseph Conrad, and other writers who love those less commonly used words and care deeply about choosing the right ones. I have to read Mieville with a dictionary at my side, but I’ve come to really appreciate the subtle shadings he creates with word choice, both in terms of meaning and in terms of mood. It’s made me think that these example sentences for vocabulary words need more context. Maybe there need to be example paragraphs, not sentences. There might be a reason to use “pulchritude” to describe Laura’s shoes, but I think it’s likely stylistic and more prose is needed to illustrate this. Also, vocabulary words should probably be taught in groups. Teach “pulchritude” alongside “beauty” and “allure,” and really illustrate the cases where one is a great choice and the others aren’t. Synonyms don’t actually mean the same thing-they are shaded differently, and vocabulary words should be presented with that sense of connotation and context. That, after all, is the interesting part, and the part that makes it worthwhile to expand vocabulary. I’ve been reading the excellent new run of Demo, comics by Brian Wood and Becky Cloonan. If you are at all interested in comics, you should be reading these. They’re a series of standalone stories, so each week’s issue is self-contained. They have some supernatural element, but so far it’s been slight–the sort of supernatural element that you could chalk up to imbalanced perceptions on the part of the narrator. 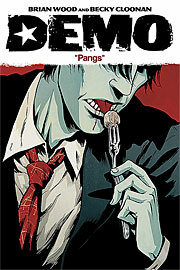 This week’s issue of Demo, called “Pangs,” was the best read of my week by far. It’s a story about a cannibal, and at some point I’m going to have to go through it panel by panel to figure out how the creators achieve the effect that they do. They don’t pull punches on the horror of cannibalism. It’s awful, and I spent the whole comic terrified of what the main character was about to do to himself or the people around him. On the other hand, they create so much sympathy for him that I wanted him to succeed, to be all right, to find a way to get away with it. But before I go off completely on a rant about this particular issue, I also want to point to the other thing I find fascinating about Demo. Both Wood and Cloonan have included material in the back of each issue about how they stretch themselves for this series, playing with different concepts and different ways of telling stories. This material provides a shining example of the benefits of experimenting with style and genre. I think that’s beautiful, and I’ve experienced that feeling of stage fright when I have an idea that I like but am not sure I can pull off. Go read these.